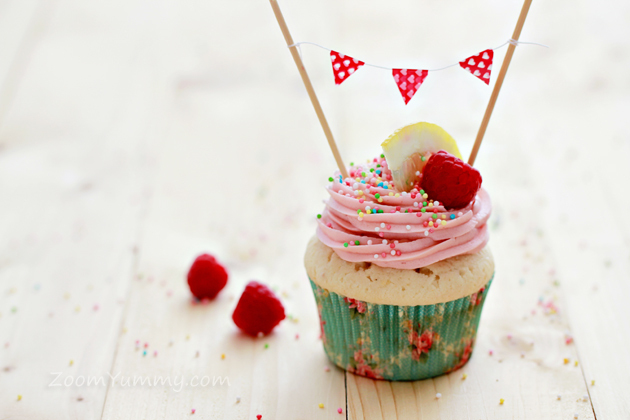 The point of this post is basically to tell you that you definitely need to, need to, need to make these cupcakes very soon. Because they are life-changing! Earth-shaking. Just absolutely amazing! 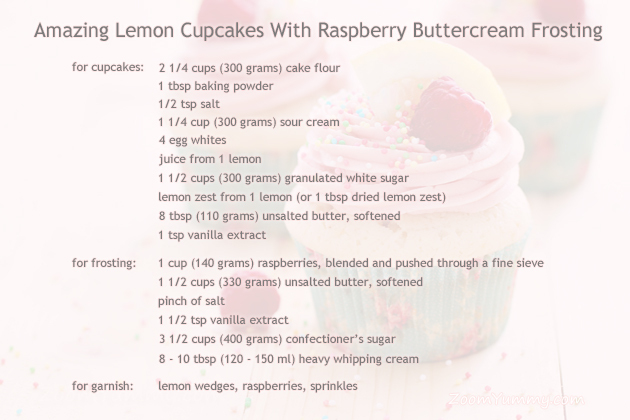 The cupcakes themselves have lemon juice and lemon zest added to them which is the reason why they reach the level of lemony deliciousness so high that you might not have even dreamed about it before. 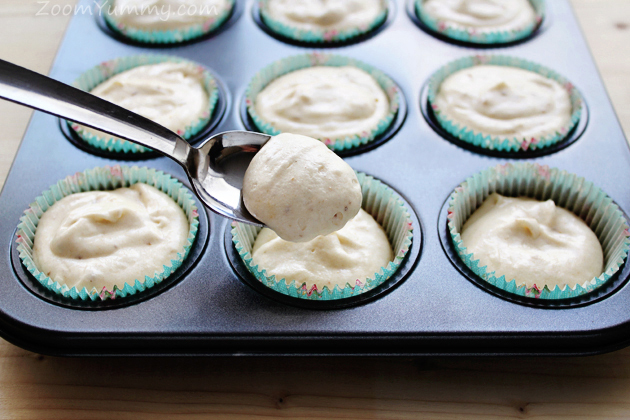 Sour cream is the secret why these little cakes are so wonderfully moist. 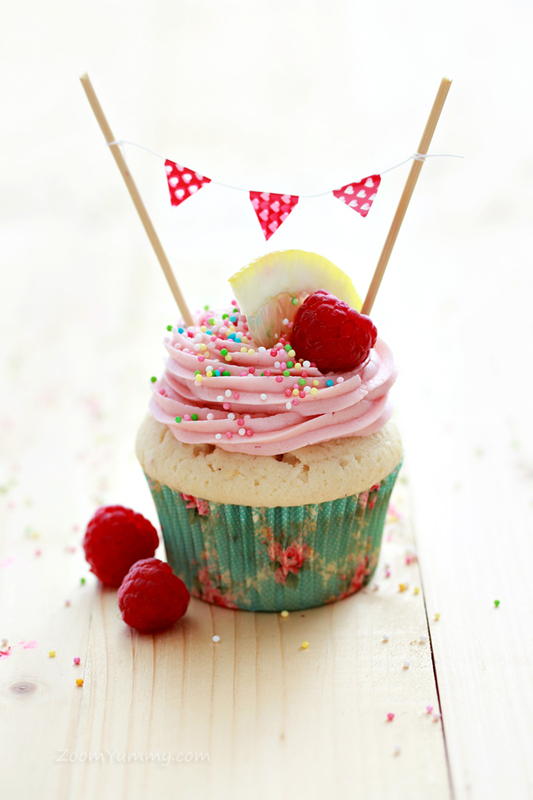 And then, putting a crown on it all and working in perfect harmony with the cupcake base, there’s this rich and buttery raspberry frosting. Mmm, finger-licking good! To tell you the truth, it all tastes even more amazing than it sounds! 1. 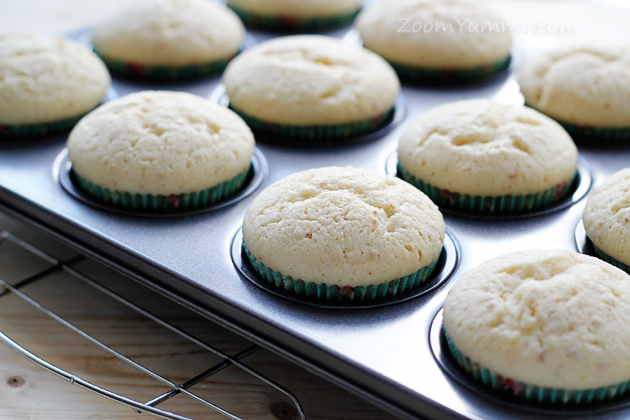 To make the cupcakes, preheat the oven to 350 °F (175 °C). 2. 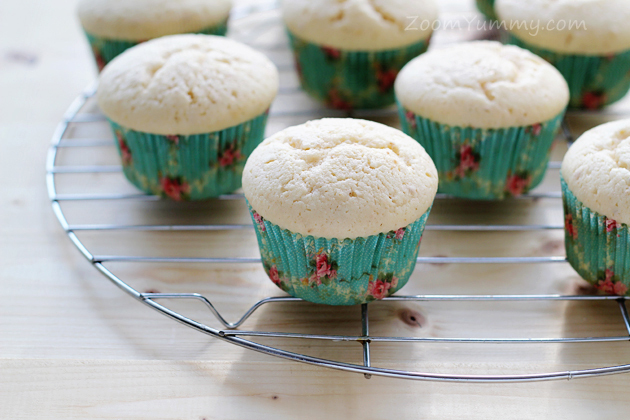 Line the cupcake tins with cupcake liners. 3. In a medium bowl, sift together the flour, baking powder and salt. 4. In a separate bowl, whisk together the sour cream and egg whites. 5. Put the sugar and lemon zest in the bowl of your stand mixer and stir to combine. Add the butter and beat at medium speed for about 3 minutes, until the butter and sugar are very light. Add the vanilla extract and lemon juice and beat until combined. Working with smaller amounts, add the ‘flour mixture’ and the ‘sour cream-egg’ mixture, alternating the wet and dry ingredients. 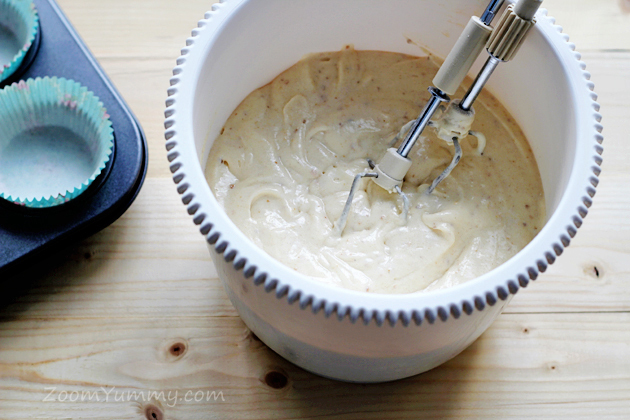 Beat on medium for about two minutes to ensure that the batter is thoroughly mixed. 6. Divide the batter evenly among the cupcake tins, filling them only about 3/4 full (I filled mine to the top resulting in slightly taller cupcakes than I’d wished for). 7. 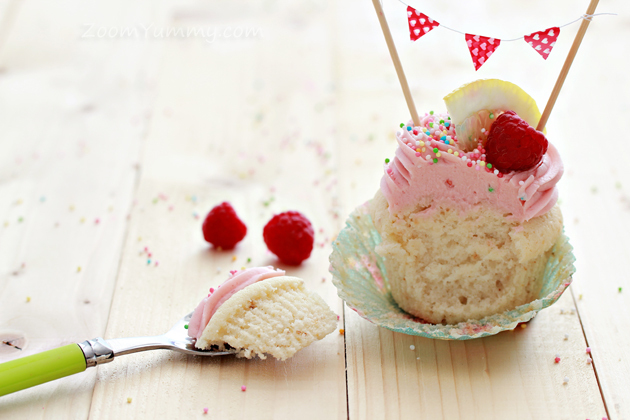 Bake for about 18-20 minutes, or until a toothpick inserted into the center of a cupcake comes out clean. 8. Cool for 5 minutes in the pan, then continue cooling on a wire rack. 9. To make the buttercream frosting, first blend the raspberries in your blender and then push the puree through a fine sieve to remove the seeds. 10. 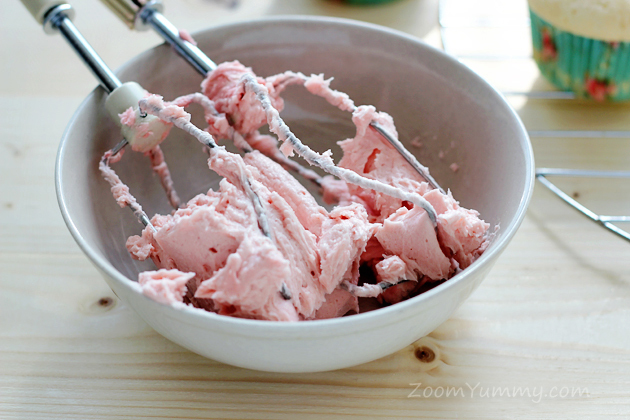 In the bowl of your electric mixer, cream the butter, raspberry puree, salt and vanilla extract. 11. Add the sugar in increments and mix thoroughly after each addition. 12. 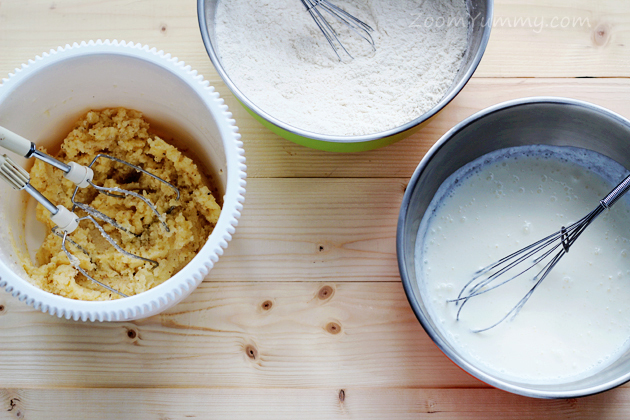 Add the cream, one tablespoon at a time, mixing after each addition, until you reach the desired consistency. 13. 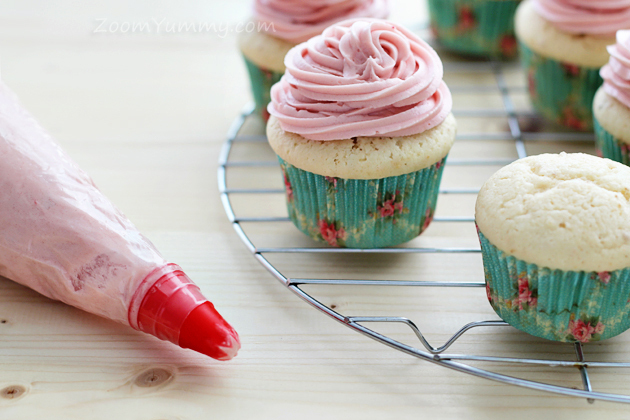 Fill a piping bag with the buttercream frosting and pipe on top of the cupcakes. 14. 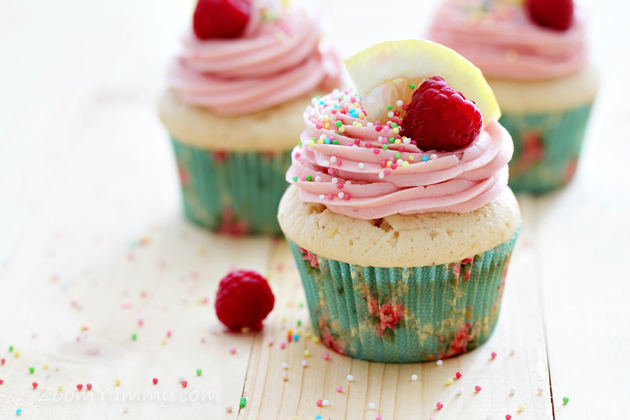 You can garnish your cupcakes with individual raspberries, small lemon wedges or sprinkles. And so much fun to make. I am sure you will love them too. 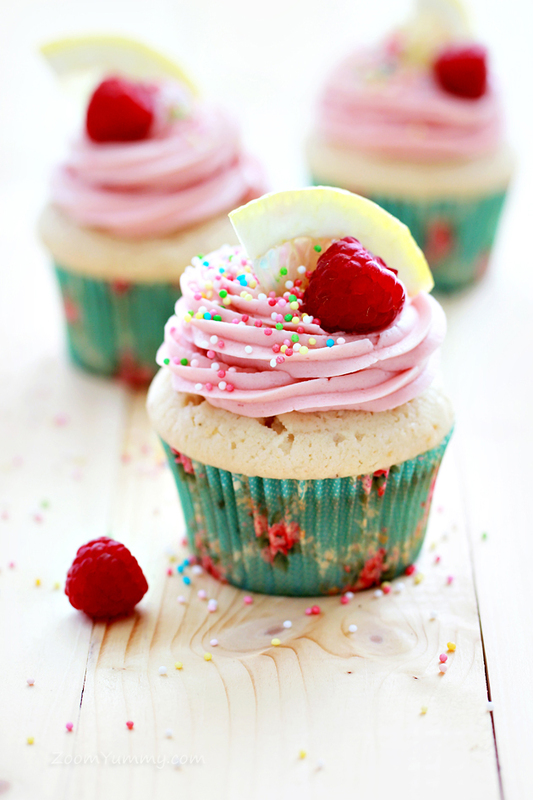 Your descriptions just made me crave for these cupcakes! They look super cute! 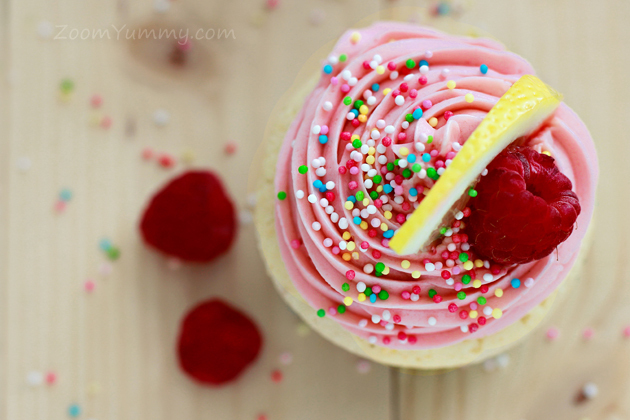 I love lemony treats, so I will certainly try this! Can’t wait to try them. They look so cute. I bet that they taste amazing.